By the time L’Apothéose de Lully was published in 1725 the Italian style, long resisted in France, was well established, brought in by a veritable flood of sonatas and cantatas. With exquisite sensibility, François Couperin sought a ‘middle way’ by uniting the French and Italian styles to produce musical perfection. 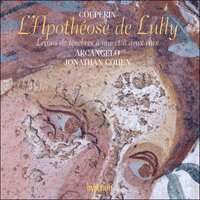 In pursuit of this lofty aim, Couperin, a master of musical illustration, provides us with a suite of musical portraits in which, among much else, Apollo descends to persuade Lully and Corelli to draw together the two great national styles of the Baroque. The pictorial movements of L’Apothéose are introduced by a reciter and all are well characterised without unnecessary exaggeration. Indeed, at times, the performance errs slightly on the side of restraint, although it is unfailingly beautiful and much aided by excellent lute and gamba continuo accompaniment. Couperin’s Leçons de ténèbres, settings of the Lamentations of Jeremiah for Holy Week, contain paradoxically some of his most sensuous music, particularly in the third Leçon for two sopranos. The breath control of Katherine Watson and Anna Dennis in the long melismatic lines is stunning, and their delivery of the abundant ornaments utterly convincing. Excellently recorded, these performances of the Leçons approach perfection.